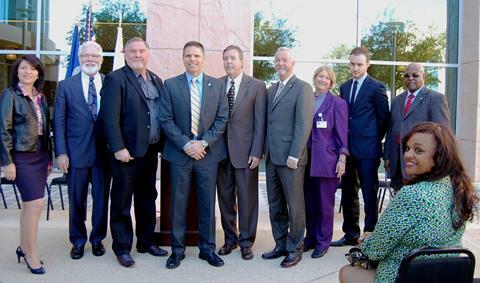 Parris and Ledford smiled and shook hands in front of the Antelope Valley Courthouse Tuesday morning, before announcing their support for James Hellmold (center) to be the next L.A. County Sheriff. 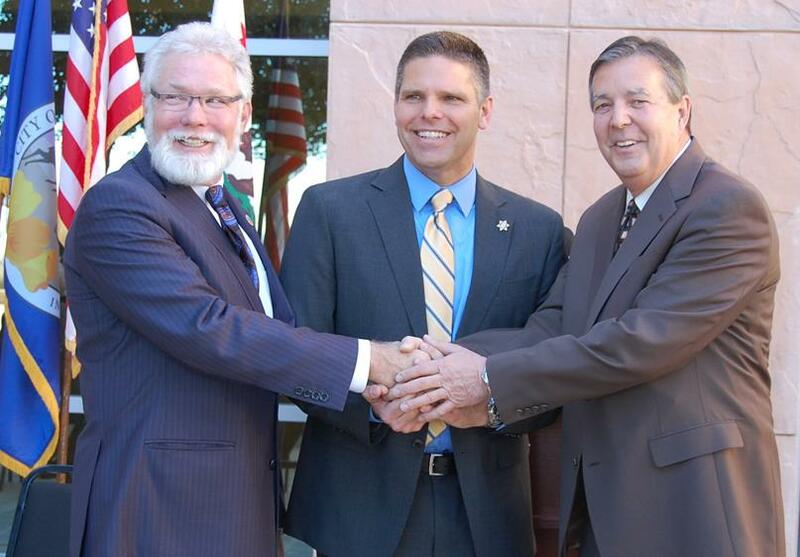 Palmdale Mayor Jim Ledford and Lancaster Mayor R. Rex Parris put political differences aside Tuesday morning to jointly announce support for Assistant Sheriff James Hellmold, as he campaigns to be the next sheriff of Los Angeles County. Ledford said Hellmold, a 25-year veteran of the sheriff’s department, had united the High Desert as far as public safety was concerned. Hellmold said Antelope Valley was a priority for him. “What we want to see is a continuation of the resources being dedicated to the sheriff’s department, and Jim Hellmold is here to guarantee that kind of continual service and commitment to the Antelope Valley,” Ledford said, adding that Hellmold was one of the few who actually knew about the Antelope Valley. “When you hear him talk, he talks about us as what we are – a place where we’re raising our families and building a community,” Ledford continued. Several Lancaster council members and city commissioners also joined the press conference to endorse James Hellmold for sheriff. As assistant sheriff, Hellmold commands all of the department’s patrol and detective divisions throughout Los Angeles County. The 46-year-old joined the Los Angeles County Sheriff’s Department in 1988. As a deputy, Hellmold received formal recognition in Long Beach and Bellflower for impacting street crime, and he also served as a youth mentor at local foster homes, according to his campaign website. In 2000, Hellmold was promoted to sergeant; and in 2005, Hellmold was promoted to lieutenant, where he served as a watch commander at Compton Station during the peak of a violent crime surge. In 2007, Hellmold was promoted to captain; and in 2011, he was promoted to commander and worked on jail reforms throughout Los Angeles County. Hellmold announced his candidacy last month, following the retirement of Sheriff Lee Baca. 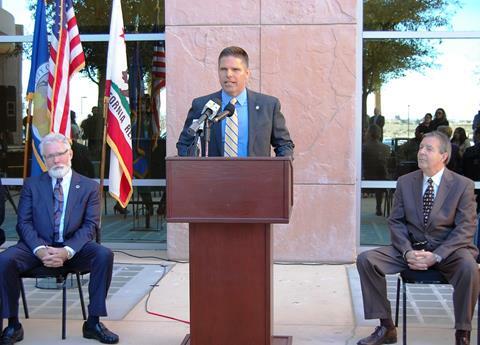 At Tuesday’s press conference, Hellmold said he was making Antelope Valley a priority. To learn more about Hellmold, visit his campaign website here. Others vying to succeed Baca for L.A. County Sheriff include former Undersheriff and Gardena Mayor Paul Tanaka; former Sheriff’s Lieutenant Patrick Gomez; Assistant Sheriff Todd Rogers; retired Sheriff’s Commander Bob Olmsted; LAPD Detective Supervisor Lou Vince; and Long Beach Police Chief Jim McDonnell. The primary election takes place in June. 21 comments for "AV mayors endorse Hellmold for sheriff"
I went on this guys website to see if he is going to be a Sheriff that will issue CCW’s. According to his website he does not want to issue CCW’s because he ‘does not want more guns on the streets’. This comment tells me he is a politician, not a person I would vote for as Sheriff. He was Baca’s driver now he an assistant Sheriff. He is part of the Baca car. Hey Mr. Hellmold, guess it’s been awhile since you worked the streets. Here’s something most of us know, the bad guys have guns, and they don’t care about the law! Where CCW’s are issued the streets are safer! If he does not care about your 2nd Amendment Rights, then I have to assume he does not care about the rest of YOUR RIGHTS! Maybe if you contribute to his campaign you and your spouse could get a CCW. That is how its been working for awhile. I will only vote for a Sheriff that WILL issue CCW’s. I will NOT vote for this guy. Unfortunately, it doesn’t look like any of the candidates are REALLY for your 2nd Amendment Rights. It looks like most of these guys are of the opinion, I have my gun that I can carry, but you can’t do the same. If Lancaster got rid of the Eye in the Sky which costs 90 grand a month could put a half dozen more officers on the street. Hell, the plane all it does is circle around Valley Central Way all day…. “The plane all it does is circle around Valley Central Way”. That’s because there’s always crime happening there (at least according to the A.V. Press crime blotter). That’s odd. Which AV Crime blotter? Today’s and most days show various crimes EAST of the 14 Freeway clustered around the BLVD between Avenues H and K.
I guess it wouldn’t look good to have the plane fly in circles over city hall and the BLVD all day. Maybe they should move the sheriff’s station to Valley Central Way since the BLVD is the ‘safest place in the universe’ as said by himself, R. Rex Parris. Not necessary to move the station…just setup some satelite stations in high crime areas. Then what? Use the spy plane as a crop duster to chase down Cary Grant a la North by Northwest???? Rex can use the plane to hang one of those beach banners behind it touting his law office! It would be much cheaper to use a helicopter than that plane. Maybe even 2. The good thing is they can easily land in the desert. This plane was a dumb idea! It’s the cops in the cars that do the job. We need more cops!!!!! Stop wasting OUR tax dollars!!! Good suggestion. No reason the AV should be like a terminator movie with a roaming eye in the sky. But then again, to feel safe people are willing to give up privacy and more. Ledford and Parris should settle their differences the correct way. A charity boxing/MMA match. Hold it at the fairgrounds, in a cage, and split all proceeds between Palmdale and Lancaster charities. Someone make this happen huh? We could put on a full card of Palmdale vs Lancaster public officials! Not. good. Rex would sue if he got punched in the nose. He is, after all, in a protected class called ‘thin-skinned lawyers who wee wee sitting down’. Another of the candidates who has been actively seeking input and support in the AV has been Lou Vince, who has a lot of interesting ideas that could be of great help here in the AV if he were to become Sheriff. Not to mention he’s in the Acton area. Which means Lou would be less likely to forget us here in the AV. Never heard of this guy. Well looks like Rex broke the law on this one. Oh? How, and where can it be reported to? This is fine and dandy but we need more police up here patrolling our streets. The AV is not safe, not the city or the desert. If no qualified police available then there are plenty of returning vets who need jobs. Get with it Mr. Mayors! Just being ex-military doesn’t mean that they are qualified or even have a desire to become police officers. While most people would agree we need more deputies it comes down to funding. How are the cities suppose to pay for all of these new deputies? How are the cities suppose to pay for all of these new deputies?How are the cities suppose to pay for all of these new deputies?Easy.Easy.Dump LEAPS.Dump LEAPS.We pay $90,000.00 a month for that worthless piece of crap.We pay $90,000.00 a month for that worthless piece of crap.For what?For what?To catch Wal-mart shoplifters?To catch Walmart shoplifters?That is $1,080,000.00 a year.That is $1,080,000.00 a year.For 10 years.For 10 years.That is $10,800,000.00.That is $10,800,000.00.That will pay for a lot of sherriffs.That will pay for a lot of sherriffs.We need more sherriffs.We need more sherriffs.More boots on the ground.More boots on the ground.We do not need LEAPS.We do not need LEAPS.Let Wal-mart pay for it’s own security.Let Wal-mart pay for it’s own security.No to LEAPS.No to LEAPS.LEAPS is supported by Paris and Crist.LEAPS is supported by Paris and Crist.They are wasting our tax dollars.They are wasting our tax dollars.To make their backers richs.To make their backers rich.No to LEAPS.No to LEAPS. Stop wasting money on the Boulevard for one. We don’t need a speed rail for two. There are plenty of ways! My husband was ex military and he became an officer. Military people aren’t stupid. They have great skills when they get out and they can become trained to be a cop. It all comes down to money which a lot is being wasted. My grandson would love to become a cop but he has PTSD. Give our military some credit please!! “….the Antelope Valley continues to be safe, and continues to get safer…..”hahahhahah LOL….What a joke…The AV is getting worse day by day…..